I built an "H" beam on my stern. Wind genny pole supported on one riser, radar mounted on the other riser and adjustable brackets for solar on the cross beam. Supports the hard dink on occasion and everything is easy to get to. It took me awhile before deciding to go that route. Works very well and sturdy as a rock. Have any pictures of that? I'm trying to come up with something for my stern; not really happy with anything I've seen yet. I have an end-boom mainsheet and a windvane. I'll take a couple of pics tomorrow. My lady is the photographer. I just build stuff and move on. Used treated 4"x 4" x 8' treated pine, 5/16" wire rope with 3/8 through eyebolt to toe rail foreword at about 45 deg angle. Chain plates to transom 15 deg angle on aft cable. 6"sq x 1/2" thick rubber on deck vibration mat with 3/8" bolt through deck bracket with single horizontal bolt for fore/aft play. Cross beam is 6'7" above deck with 20" gussets. Cables were hand tight when I sat on the cross beam installing genny and radar and she didn't wiggle. Radar is 8'6" above deck. Genny is 2 1/2' higher. Although H beam is built bull strong, deck attachments are less so. I wanted to protect deck and hull integrity in the case of breaking waves. This has seen some rough weather in the GOM since being installed and seems to be working out. I may rebuild with a varnished version down the road. I would mount the Furuno on the mizzen mast, standard height. This is the stand alone Radar unit. I was hoping a G5 version would be released. With all new Simrad electronics, very tempting to add the Simrad ( G4 / G5 ) for close range at night. Any one considering the same. Feed back welcome. Sure it is non-Ionizing radiation, but I myself would prefer to have the Antenna as far from myself as possible. Also the higher elevation may give a few extra feet of range and a little bit less surface return closer in. The typical beam width specification is ±12.5°, so having the array several feet above the head is usually good, depending upon the boat configuration. On my boat I go to radar standby instead of active when passengers are on the bow, exposed to the transmit path. The instructions for the new HD arrays do not include precautions about the transmit beam, but I am old-school and would continue to avoid beam exposure. It blocks easy access to the BBQ but I normally take it off the rail to cook anyway. I initially used the "eye nut" for the aft shroud but the steep angle bent the eye bolt. Do you get much output from the solar array, as it would seem that the wind gen and radar would produce significant shading of the panels??? I realize that you have "adjustable" brackets for the solar panels, so I'm just wondering how much power you're actually getting out of the panels (and what the total wattage of your array is)??? 600w genny, 90w solar. 2 8D batts for engine start and bilge, 4 300ah AGM batts for house, biggest demand is refrigerator and radar. Solar is primarily for engine batts, wind for house but have switched config. 60 amp alt on engine. Can connect everything together in emergency but never needed as yet. Knock wood. I use LED's where I can and conserve anytime not hooked up to shore power. Keep an eye on my voltage on the hook and underway. I have checked my solar in partial shade and while output drops I can't tell you percentages off the cuff. Best to have it high enough on the mast that no one's head is radiated regardless where one is on deck. Thanks for that. I have a canoe stern so it narrows in the back a lot. I think I might have to go wider, outboard, and then have bent stainless that mounts to the hull with a flange rather than go towards the (very limited) deck space. I was afraid of the flange mount being to strong and a wave washing it all away, leaving major deck damage. I have a single 3/8 bolt through the deck with a fender washer holding the base swivel. My base swivel will be the shear point. Mounting radar on the mast with a swivel joint just under the spreaders I've seen two problems. That close to the mast I have a bit of a blind spot dead astern. Problematic when in narrow channels in the fog. The other, only once was on a stormy dark night, unable to recognize the image on the screen, I went forward to find an errent halyard had caught the dome at pulled it sideways, pointing at the fordeck. 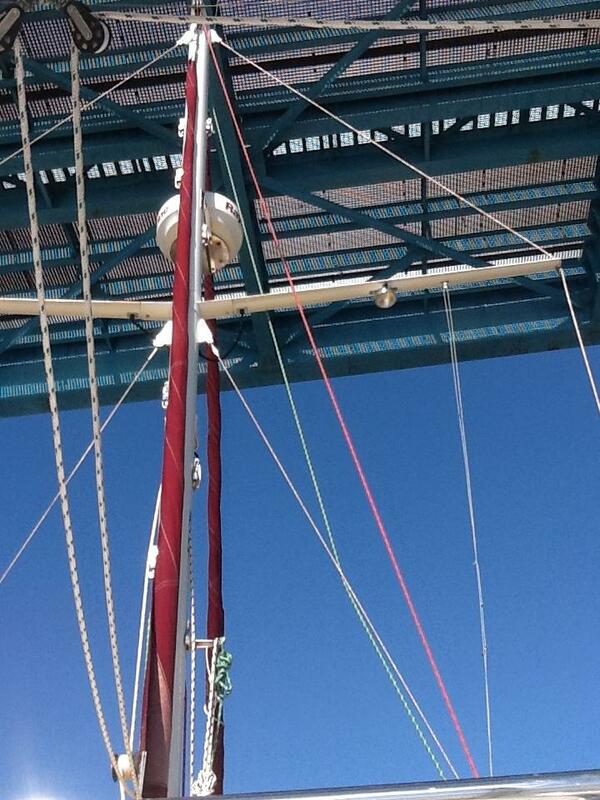 That far up the mast hasn't reduced the ability to see smaller closeup things like moorings and kayakers. All and all I"m good with it there. On my boat I use radar differently than in the past. AIS gives me long distance info on the vast majority targets I care about. I use radar in its long ranges only for looking at thunder storms. I use a chart plotter to find buoys that are 3 miles out. I use radar in fog and at night for close in targets -- sometimes close in like in yards. I use MARPA to check on targets without AIS that concern me. Weight in the standing rig does nothing good for a boat. For these reasons tbe last two Radars I've installed were on stern poles. Radar really is only dependable way to keep track of traffic, being real time. Here in the Puget sound the AIS tracking seems to have a lag time that means they could run you over and be gone before got notice. Marpa, I've heard sometimes will drop it's targets. Hardly anyone seems to blow their horn anymore. Scary stuff. You're being a bit dramatic. AIS has a lag based on the reception quality and the TX time of the sender. But it is plenty adequate for collision avoidance. The vast majority of our sailing time is done with the Radar off- unneeded power draw. The Puget Sound is busy, but so are lots of other places. All times are GMT -7. The time now is 12:55.